Haig whisky is steeped in history since it was first distilled by John Haig in Cameronbridge Scotland in 1824. From these humble beginnings, Haig Whisky quickly rose to become one of the most successful and popular Scotch whiskies in the world before falling into decline some 30 years ago as it left the Haig family ownership and was passed through a series of multinational drinks companies. The Cameronbridge distillery meanwhile went from strength to strength and now, in the ownership of Diageo, is one of the largest distilleries in Europe. In 2014, Diageo launched a new Haig whisky to add to the existing old guard whisky stable of Haig Gold Label, Haig Dimple and Haig Pinch blended scotch whiskies. Haig Club, in its distinctive square blue bottle and luxury packaging, is a smooth, versatile and easy drinking single grain scotch whisky aimed at converting a new generation of younger drinker over to the wonderful world of Scotch Single Grain Whisky. Diageo say that it’s a blend of three grain whiskies each of which have been matured in different types of casks. David Beckham is the public face of the first new offering in more than 30 years from Haig Whisky, one of the oldest whiskies in the world. Haig Club is an exceptionally easy drinking whisky firmly aimed at converting a new generation to the wonderful world of Scotch whisky drinking. It’s smooth, sophisticated and stylish. It’s modern Scotland in a glass! Nose: Fresh, Smooth and pleasantly fruity on first sniff with a tang of citrus. Taste: Slightly sweet at first warming to a warm soft gingerbread and whisky mouth feel. Finish: vanilla and faint background of burnt wood. Haig Club is a bold new Single Grain Whisky. Single Grain Whisky is often used in blended whisky to tone down the wilder flavours of Single Malt and Pot Still spice. It is no surprise then that Diageo have also turned to a full single grain whisky to create the definitive entry level whisky aimed at convincing non whisky drinkers of vodka and gin that whisky is the direction that their future spirit life should take. Yes, to a certain degree it may be a victory of marketing and branding over substance but you have to consider the entire package. 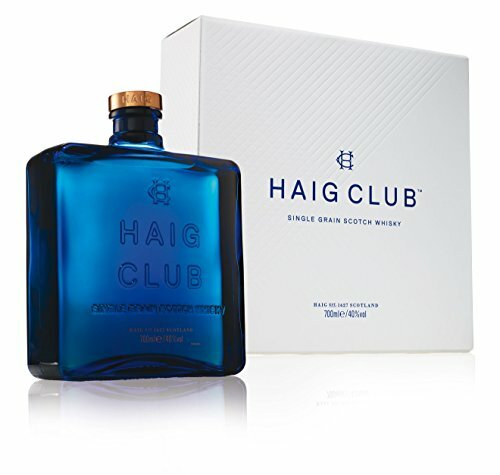 With it’s distinctive bright blue bottle and luxury packaging, Haig Club could easily become one of the most popular and desirable Father’s Day presents of 2015! A worthy recipient of a One Pooka award as an easy drinking, fun, every-day and party whisky. Haig Club Whisky, an innovative new whisky from Diageo has relaunched the long dormant House of Haig which once produced the most popular Scotch whiskies in the world. That title may soon return with this stylish, light and easy drinking Single Grain Scotch Whisky in it’s attractive and striking square blue bottle promoted by David Beckham. All of the “buy online” links on HaigWhisky.com give you a chance to buy Haig Club Single Grain Scotch Whisky online from Amazon, Whiskey Exchange or the Master of Malt for which we are affiliates. Each of these reputable vendors will then process your order securely and deliver your Haig Club Scotch Whisky directly to you to enjoy. Stuart says – “you will enjoy”. Haig Whisky is the oldest of all scotch whiskies and may even be the oldest whisky in the world. Haig whisky is steeped in history since it was first distilled by John Haig in Cameronbridge Scotland in 1824. From these humble beginnings Haig Whisky quickly rose to become one of the most successful and popular Scotch whiskies in the world and now offer four Scotch Whiskys: Haig Club, Haig Gold, Haig Dimple & Haig Pinch.